I don't have a specific oil discussion queued up but I thought I'd share this chart as oil is in apparent free fall and there is nothing OPEC, Russia or the US shale companies can do to stop it right now. 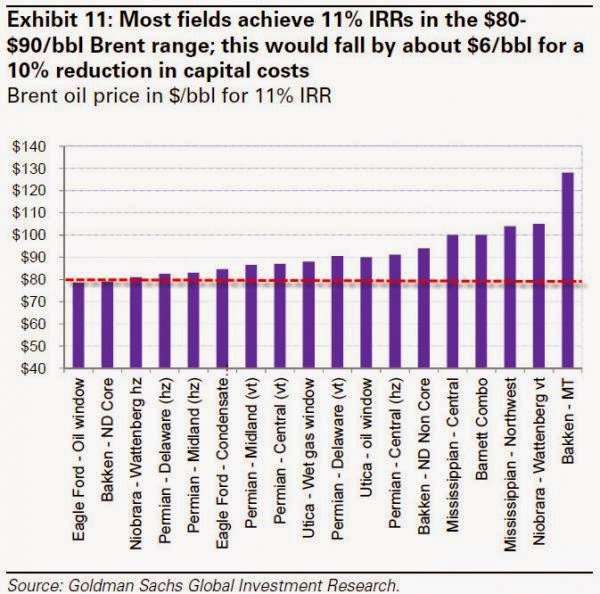 1) Oversupply via Saudi Arabia - This is a strategic geopolitical move to impact Russia, Iran and I think to a lesser extent US shale companies. Our best friends, the Saudis, don't love the fact that we've figured out how to pull carbon out of the ground. 2) Weakening demand - China is the main culprit here. Despite all of the rosy chit-chat, if you talk to people on the ground in China you'll hear that things are really slowing over there. 3) Strengthening dollar - much like in 2008 during the global financial crisis, the US dollar is being bid up as things are weakening around the globe. Since most oil is still priced in US $, a $ buys more oil as it goes up in value. Here's where things get interesting - check out this chart via Goldman Sachs. Most of the major shale production in the US loses money below $80/barrel. If this remains a prolonged slump (and Russia seems to be planning for a 2-3 year slump), then the US Shale miracle is going to become a nightmare. Most of these companies carry massive debt loads and if they aren't making money, the entire shale boom in the US could go bust very quickly (anyone remember Houston/Dallas in the mid-80's?). I don't have anything to add here other than to say "Party like it's 1999". Stocks were probably overvalued in 2008, undervalued in 2009, fairly valued in late 2009, I'll let you make your own determination on what the $@$% is going on in 2014. * Reminder that I'm still talking politics over at NY21poli - I linked to a great story of what it's like to run for office today which is worth a look.